The Koracha of Tamil Nadu speak, read and write in Tamil. They are not vegetarians but do not eat beef and eat rice as a cereal. They have adult marriages and are monogamous. They have birth and marriage rituals. The dead are buried. The bereaved can marry again. On the death of the father, sons inherit the property with the oldest son becoming in charge of the home. Hinduism is their religion. Basket work is done by them as their main occupation. They have a caste association to look after them. Modern and traditional medicines are used by them. They are educated. The Koracha live in Andhra Pradesh too. They prefer cousin marriages. Many of them are nomads. They speak, read and write in Telugu. Some of them do use family planning. 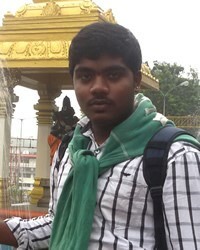 * Pray that the caste association leaders come to Jesus Christ and lead others to Him. Singh, K. S., ed. 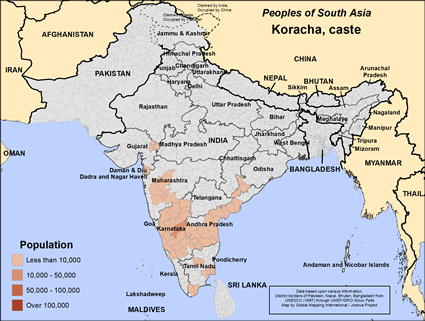 "India's Communities A-Z", Oxford University Press, USA 1999View Koracha, caste in all countries.